Jeremy Roenick’s face is a disaster. Both eyes are sporting ugly shiners, and we’re pretty sure his nose isn’t pointing the same direction it was when the season started. Worst of all, it’s not even his fault – he’s been in ten fights in the first month of the season. This isn’t because J.R. is particularly prone to fisticuffs, although he mixed it up plenty during his Hall of Fame-worthy career. Rather, we’re so bored playing as him in NHL 12’s new Be A Legend mode that we can’t help but drop the gloves two or even three times a game; thanks to the new ability to sim through all the time he’s in the sin bin, it makes the games go faster. The fact we want that to happen is alarming – and a shame. NHL 12 is a tremendous hockey game that’s sadly marketed around an abysmal new Legends mode. We cheered when we heard that a slew of legendary skaters would make an appearance this year, including names like Gretzky, Lemieux, Roy, and Howe. It’s too bad that the implementation of these guys is only through the Be A Pro mode. First off, if you’ve spent 50+ hours like us doing this in years past, Be A Pro has lost much of its luster. Secondly, there’s no discernable difference when you’re a Legend or a new person that you create; each historic player can be inserted onto any team with its current lineup and schedule. Lastly, you have to start with Roenick and slowly work your way up the ladder to unlock the other Legends. For $60, they should all be available right off the bat. In other words, there’s no magic, only grinding. Lots and lots of grinding. After we stepped away from the legends on ice, though, our perspective changed for the better. NHL 12’s core 5-on-5 gameplay is as good as it gets, featuring a bevy of key improvements. The puck behaves more like, well, a real puck than ever. No longer will it magically glide along with you while you leisurely wind up for a slap shot; you’d better fire quickly, otherwise it skips away from you. Even better, the physicality of the game is more important. If you park a hulking power forward in front of the net, it’ll take someone of equal or greater strength to get him out of there. Gone are the days when a little sprite like Brian Gionta can have his way with a monster of Dustin Penner’s girth. Vicious battles in the crease are commonplace, and winning them more often than not will translate into goals. Speaking of brutal confrontations in front of the net, goaltenders are now fair game (so to speak). You can crash into them and attempt to shove them out of the way to catch a lucky break, something that’s been sorely lacking in years past. Naturally, if you’re too obvious about it, you’ll be penalized for it. Even better, there’s plenty of post-whistle slashing you can to do anyone on the ice if you’re ticked off. That really helped us in our quest to make Roenick’s legend story move faster, even at the cost of getting his face rearranged. 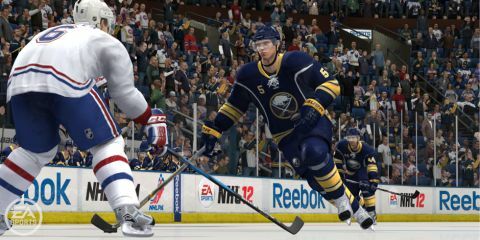 There’s so much to NHL 12 that it’s really like four games in one. Traditionalists get to lace up the skates in season, playoff, and franchise modes, online and off. Stat-obsessed general manager wannabes get an updated GM mode that is comparable to PC sport management simulators. Fantasy types get to build an Ultimate Team by purchasing online trading cards, train, heal and organize their team, then play against other user squads at their own pace thanks to smart download technology. Then of course there’s EA Sports Hockey League, a monthly online club-based competition that’s incredibly popular with its core users. Each of those will sustain plenty of gamers through the long winter ahead, even if few players will spend time in all of them. The Winter Classic also makes an appearance, a welcome addition even if it’s ultimately a glorified exhibition. It also would have been nice to have this year’s game instead of last season’s, although we know it’s probably a legal issue preventing Citizen’s Bank Park (the Jan 2 2012 site) from appearing. Stinkin’ lawyers. It would have taken the world’s lousiest miracle to make NHL 12 a bad game. After all, the core gameplay is so solid that their NHL 2K competition said “no mas” and got out of the business. Our only complaint is that EA should have let the Legends simmer for a season or two until a compelling, “holy crap this is awesome” way to integrate the greatest players in history could have been dreamed up. To be frank, the Legends detract from the game more than anything else. We’re much happier now that we’ve bagged our pursuit up that ladder; we’re more content gunning for a Stanley Cup. Description Though the Be A Legend mode is on thin ice, NHL 12 still provides solid five-on-five hockey action and face-breaking fun.